I had the other half of the avocado from yesterday, anybody who knows avocados knows that half wouldn’t last very long, as in, not past today but I didn’t have anymore tuna so I had to find something else to try. 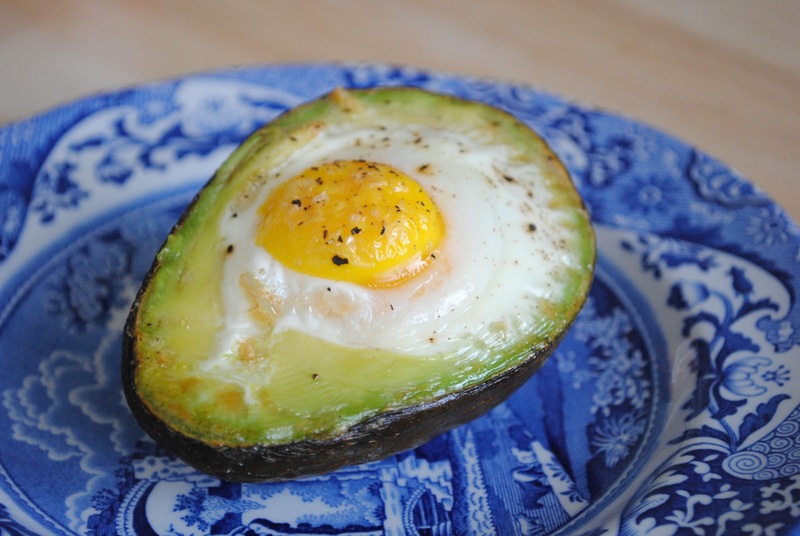 I kept seeing recipes on my facebook news feed for baked avocado with egg so I googled and voila! a whole lotta recipes came up. Gotta love google! Basically you cut an avocado in half, take out the pit, scoop a bit out of each side of the avocado (some sites recommend 2 tblsp of avocado get scooped, I just kinda eyeballed it), crack an egg into the hole, bake for 15-17 minutes at 425 degrees. The cooking time is also approximate, each recipe had slightly different times but all said keep an eye on it and bake until the white part is set. shrug. Seemed fairly easy. Most of the recipes used a variety of seasoning, everything from salt and pepper to paprika, fresh chives etc. I don’t get that. Why people always feel the need to season food to taste like something else when it tastes really good as it is. Like veggies. People so often seem to drown their veggies in a sauce or seasonings and that confuses me, I like how veggies taste, I am perfectly happy to cook some veggies and eat them just like that, so they taste like how they naturally taste. Seems to be a “me” thing though, shrug. Anyways, I wondered if maybe this combo needed seasoning, maybe it wouldn’t be good without, so I put some pepper on it. I kinda messed up this evening though. Oh dear. I tracked the best I could tho! I counted everything I ate and didn’t touch sooooo much of the delish looking food, even though I really really wanted to. I totally caved with the nanaimo bars though, I have a weakness, *big epic sigh* Nanaimo bars are so good! But soooo bad for me! Almost 200 calories per piece! That’s ridiculous! Especially since it’s a small piece! If I was going to eat a square of nanaimo bar the least I could have done was eat one piece, not two but nooOOOooo not me, I had to have two *rolls eyes at self*. I got home and added the food I ate at the fundraiser to my Lose It! app. There were a couple items that are approximated but I think fairly close, and just in case I estimated high. Luckily I bowled so I burned some calories there, yay! I’m mad at myself for eating while at the fundraiser, I wasn’t feeling particularly hungry, it was seeing everyone else eating and enjoying the food that made me want to eat. Like I had to eat to fit in or something…which is dumb cause it is my dragon boat team, I already have a place there, no need to try to fit in. I was feeling a bit apart from everything though, I mean, it was great to see everyone, and the fundraiser seemed to go well, people had fun, but I felt like I had to force myself to be social, push myself to seem like I was having as good a time as everyone else. Normally at dragon boat functions I just have fun, no pushing needed, but not this evening…I guess I’m still dealing with what happened last weekend? By the time I got home I really wanted to eat! Not because I am hungry, but because, well, I want to. Which is stupid. If I wasn’t tracking my food, even though I had nibblies at the fundraiser I would have without second thought dived in to some sort of food. Cookies maybe, or some toast, Mmm bread!, chocolate perhaps, or a banana pudding…I don’t know what I would have eaten but I would have eaten something. Instead I made a cup of tea, sat down and started blogging while watching a movie on my tv. Ahh multi-tasking! lol I guess I should be proud of myself for not caving and eating something else when I’m not actually hungry but right now all I feel is deprived lol But what am I depriving myself of? Over indulging on un-healthy food I don’t need that will make me fatter? Why do I feel deprived about that?! That’s messed up my friends. Messed. Up. ← Salsa and Tuna, Who Knew?